My car was delivered to Rye Ford, in Rye, NY in February of 1968, and was raced under the dealership from 1968 until 1969 by me. The dealership made a commitment to Ford to race the car for one year. 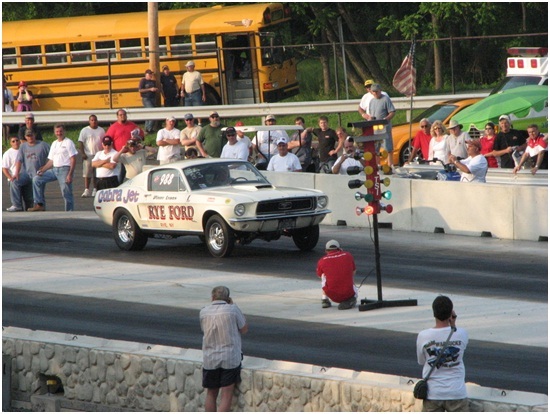 In April of 1969, I purchased the car from Rye Ford and continued to race the car until 1976. The car had been raced at Connecticut Dragway, Dover Dragstrip, National Speedway on Long Island, Rising Sun, Maryland, and Fayetteville, North Carolina. After this time, the car was parked in a garage for the next 15 years. The car is now trailered to shows. As the original owner for the past 40 years, very little has been done to the car. The original mileage is 782 miles. The car has been repainted and re-lettered in 1990, and the motor was rebuilt to stock specification in 2006. Traction bars and roll bar were added by the dealership back in 1968. 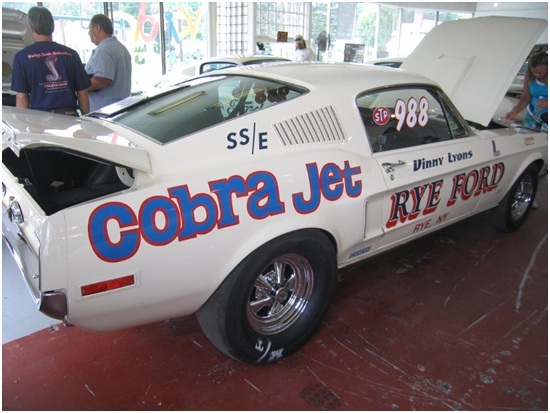 The car is pictured first in the Carlisle showroom during the Cobra Jet Reunion at the 2008 All Ford Nationals and then at the Carlisle dragstrip, where it was unbeaten.